Oliver’s mom need our love… after a battle with lymphoma, he earned his angel wings tonight. She writes: Oliver went to the Rainbow Bridge this evening. He was the sweetest boy from the moment I met him. He was quiet and calm. He loved to snuggle. He wasn’t one for big sloppy kisses. He preferred the sneaking kiss and would often get me on the nose. I will miss him more than words can say. Thank you for letting me adopt and love this sweet boy. 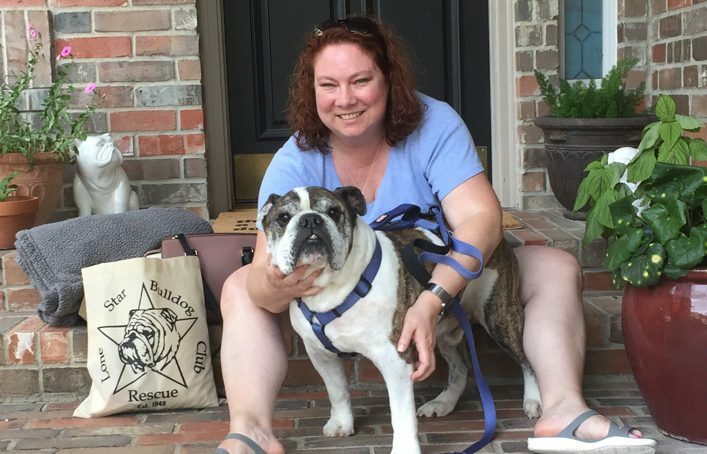 Elrod has been adopted! 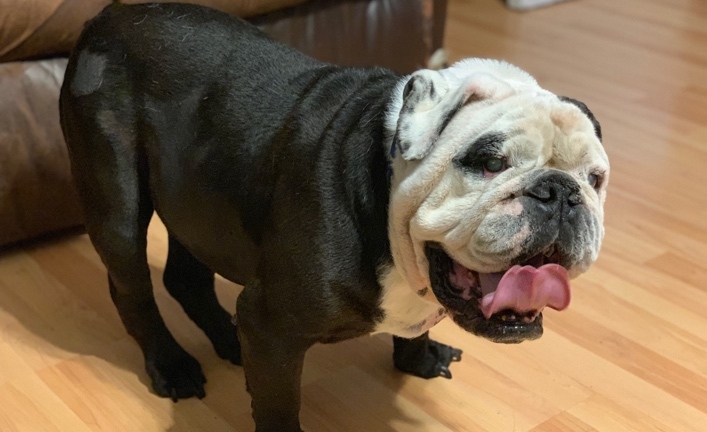 From his foster family: After 100 days in rescue, sweetest boy Elrod has been adopted, and begins his new life as Oliver. Oliver is such a fitting name for this beautiful soul. His story really mirrors the classic Dickens character of the same name: Dickens’ hero found himself struggling to survive on the tough streets of 19th century London, while ours faced a similar challenge (through no fault of his own) here in Texas. Oliver’s time on the streets robbed him of his hearing, but not his spirit. It left him heartworm positive, but did not alter his sweet and gentle disposition. It made him more deliberate in his movements and actions, but did not diminish his capacity to love. The real reason the name Oliver fits this boy so well, though, is in how both stories turned out. Dickens’ Oliver was rescued and adopted by the kindly Mr. Brownlow. Our Oliver found his own angel in Becky. 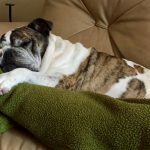 Oliver will join his new sister Millie (also a Lone Star Bulldog Club Rescue alumnus) and will spend the rest of his days knowing only love and comfort. As it should be. 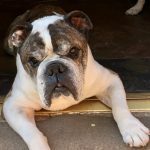 We find ourselves continuing to learn more lessons about life from these gentle dogs than we would have ever thought possible, and Oliver had more lessons to teach than most. Resilience. Perseverance. Grace. Love. Rescue. Redemption. Oliver. God Speed, beautiful boy. Your paw prints will forever remain on our hearts. 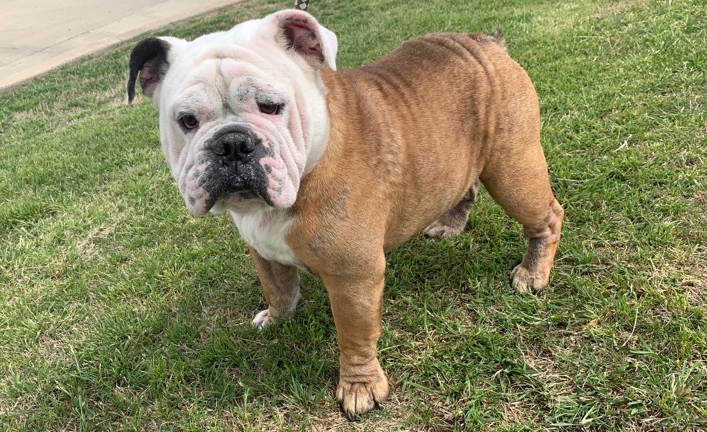 Please welcome Elrod to the Lone Star Bulldog Club Rescue family! 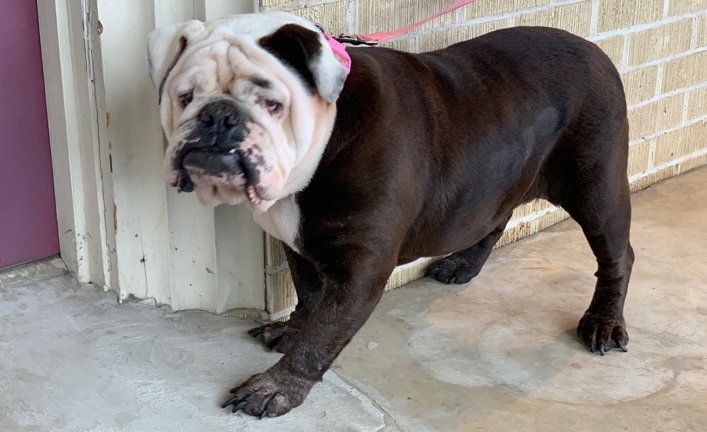 After found roaming the streets, Elrod was taken to a local shelter. Unfortunately, he is heartworm positive, has some tail issues and is underweight, but we’ll get him healthy again! He’s estimated to be about 2 years old. 3/13/17 Update: In addition to his heartworm treatment, Elrod has an ingrown tail that needs to be removed and he needs to be neutered. We estimate the vet bill to be $2,000. 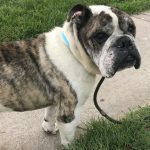 But everyone says he is such a sweet guy and will make a great addition to any family when he gets well. 4/16/17 Update: Elrod joined our family this past week and he is an absolute cutie. He is done with his heart worm confinement and ready to explore his new world. Elrod was a stray and being in a home is all new for him. He hasn’t shown any interest in toys yet as we don’t think he knows what to do with them. He loves kisses and affection, though and he is getting it in spades. His dark brown eyes will just melt your heart. Everything is great with his foster siblings and we are working on putting a couple of pounds on his thin little frame. He doesnt seem to mind the extra food! 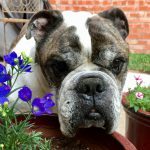 Elrod spent his Easter enjoying the beautiful weather and helping out foster mom in the garden, posing with his favorite flower. Sweet Elrod. Its a phrase that foster mom and dad say several times a day about this boy. Elrod wants nothing more than to be with his humans. He is a little slow, but he follows you around every room you go to and will just stand next to you, making sure he is making contact with your leg. Who can resist this? 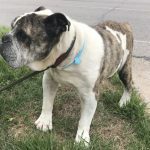 Elrod is about 6 years old and you can tell he has had a hard life-probably a life outside. He can’t hear well, moves at his own pace and sometimes seems confused on where he is. But what an angel this little man is. He gets along great with his foster siblings and no aggression whatsoever. Just a complete lovebug! He has mastered house training, but for some reason he has a strange fetish for cardboard boxes and/or DVD’s. We have to tap him gently to get his attention and redirect. I am trying to teach him some signs for basic commands and he seems to be responding. 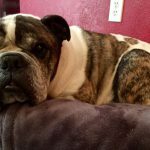 If you want a snuggler on the couch with you and a bulldog you can give kisses anytime you want, Elrod is your baby! 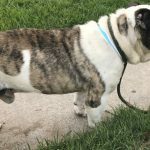 5/31/17 Update: Elrod checking in! I’ve had a great couple of weeks with my foster family. My days are filled with naps and toy chewing, along with awesome grub and lots of love. Oh, and more naps. The foster ‘rents went on a trip and had these awesome chicks come in to take care of me and my foster siblings. They made everything stay just the same for us. Please see the above schedule. LOL When Foster Ma and Pa got back, I was so happy to see them and I think they were pretty excited, too. Foster Ma feeds me great food with raw goats milk, some stinky stuff called fish stock that tastes better than it smells and all this other stuff that she SAYS is good for me. I definitely don’t scratch anymore because of it! 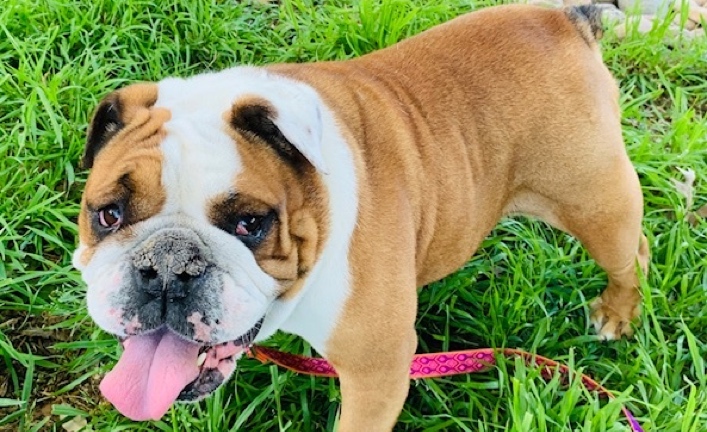 I’m just your, run-of-the-mill Bulldog who loves to snuggle and chew on any cardboard I can find. I can’t explain it, but it is my kryptonite. Before I know it, my dad is picking me up and placing me on the couch with him. He thinks it’ll distract me … and OK, it does. Two-hour naps are the best on the couch! 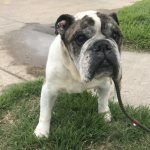 I don’t hear too well, but that’s OK. Foster Ma gets my attention with a little tap on my bum and waits for me. Let me know if you are interested in a guy like me. I’ll be on the couch waiting.